Marc Stratton has flown his own version of the Minnesota state flag from a 30-foot pole at his home in Rollag since 1997. Nobody’s saluted it yet. But he’s hoping. And that’s been even more evident since the Sept. 11 terrorist attack on America. Two years ago, Stratton sent his design to Sen. Edward C. Oliver, R-Deephaven, Dist. 43, who that year introduced a bill calling for a study to look into changing the state flag. The senator began the inquiry because he wanted to know why more Minnesotans didn’t fly the state flag at their homes. The other design, created by two Rochester, Minn., men, is similar to Stratton’s, although both parties came up with their designs separately. Stratton also submitted his design last year to the “It’s a Grand New Flag” contest sponsored by the Utne Reader, a nationally circulated alternative magazine headquartered in the Twin Cities. The contest was a spin-off of an article in the magazine last summer that focused on the blandness of most state flags. Stratton’s design for a new Minnesota flag took first place in the Utne Reader contest, announced a couple of months ago. This isn’t the first time the state’s flag design has come under scrutiny. 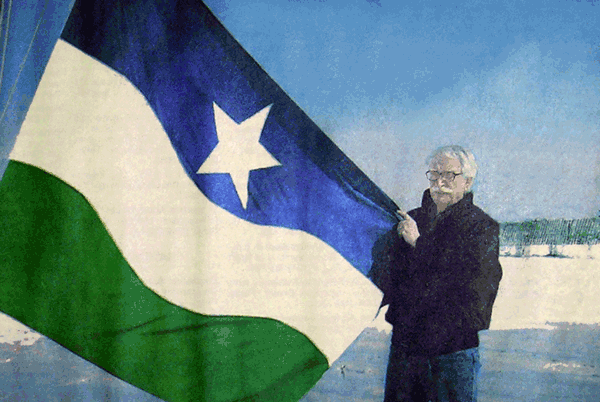 In 1989, a citizens’ coalition began a campaign for a new flag in preparation for the centennial of the first state flag. Two hearings were held in the House, but nothing happened despite endorsements for the change from international flag experts. Endorsements also came from both the Minneapolis and St. Paul daily newspapers. So what’s all the flap over the current Minnesota flag? The current flag uses a version of the state seal against a blue background. Three dates are woven into the fabric: 1819, the date Fort Snelling was established; 1858, the date of statehood; and 1893, the year the official flag was adopted. It’s emblazoned with 19 stars, symbolizing the fact that Minnesota was the 19th state to join the union. The state’s motto, “L’Etoile du Nord” (The Star of the North), also appears on a banner over an illustration of a farmer plowing a field and an American Indian riding into the sunset. A wreath of the state flower, the lady slipper, surrounds the seal. Stratton isn’t alone in his dislike of the current flag. The North American Vexillogical (the study of flags) Association ranks it 67th out of 72 state, provincial and territorial flags. > A flag should be so simple that a child can draw it from memory. > A flag should use symbolism that is meaningful. > A flag should only use two to three basic colors that contrast well and come from the standard color set. > A flag should never use lettering or state seals because they appear reversed on one side of the flag. > A flag should be distinctive but can use similarities to show connections to our history. Stratton’s design is blue on top (symbolizing the sky), green on bottom (symbolizing summer), and split in half with a wavy white band (for winter). Centered in the top blue field is a large white star, representing the North Star. “I designed it simply to make it quick and easy to recognize,” he says. “And I wanted a symbol of nature and the landscape dominated by a large North Star. Meanwhile, Stratton intends to continue flying his version of the Minnesota flag at his home, where it will flap in the sky over Rollag waiting for a verdict.